Very exciting San Francisco history discovery by HopeChest over on Tiki Central: 375 Bush in San Francisco, the current address of Pagan Idol, was once a Tiki Bob’s location. This location was called Tiki Bob’s Mainland, or Tiki Bob’s Mainland Rendezvous, it was a relatively short-lived spinoff of the original Tiki Bob’s at Post & Taylor. It had a gimmick: lingerie shows. To lure local businessmen into the restaurant, there were models wearing lingerie walking all around, ostensibly enticing the men to purchase lingerie to bring home to their wives. Lingerie shows were a thing in the area for a while… as late as the 2000s, nearby Sutter Station tavern was still doing them. This news was a welcome surprise to the crew at Pagan Idol; they’d known that there’d been a Tiki Bob’s nearby, but the address that was floating out there was incorrect, so this is the first they’d heard that it was in their exact same spot. What an incredible coincidence! 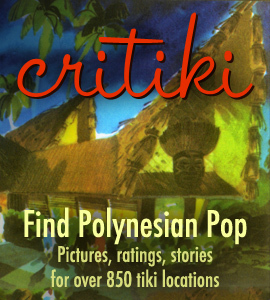 I had never taken the time to put the second Tiki Bob’s location into Critiki, so I added it this morning. Mahalo to HopeChest for finding this photo, the correct address, and for sharing it! I have to say, that is pretty darn cool! Thanks for all the updates lately. Much aporeciated!